Providing leadership training and development to improve outcomes for underprivileged children. 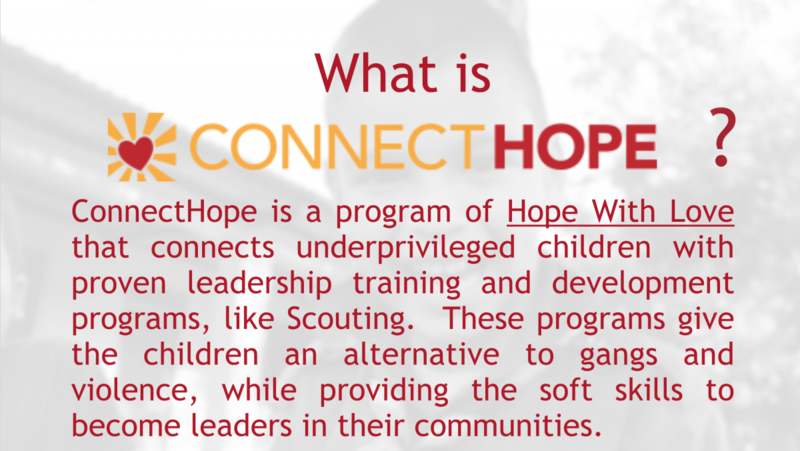 Find out more about ConnectHope and sponsor a child today! Regular exercise and proper nutrition. Leadership and skills training through active learning. Providing a moral and ethical foundation for life. Providing a communication hub to increase awareness and access to existing social services. Click here to visit the official HopeOneSource web site. Providing an annual award for an organization's exemplary collaboration with other organizations to improve the lives of the poor and oppressed. Recognizing exemplary efforts to serve the poor. Acknowledging creative and effictient efforts to serve the poor. Bringing awareness to existing efforts to maximize outcomes. Needs identified in Haiti. Began research and development of HopeOneSource to improve collaboration of medical providers. Launched initiatives to increase Scouting, providing children with an alternative to street gangs. ConnectHope expands it program to serve underprivileged children, both stateside and abroad. HopeOneSource expands to Washington, DC to connect people to services experiencing poverty and oppression.